Unlike some other suppliers I contacted, Luke came back to me very quickly and provided a quote and did the work very promptly. I was given plenty of advice on options available to me but was not unduly pressurised to include work I didn't want. I am very happy with the way my drive now looks - a great improvement. Cleaning garden patio and path, grip fix and between all slabs sealing all above plus sealing front drive and path. "Luke Boswell and his team were extremely professional. They were always polite and very cheerful. It was a delight to have them and would recommend them anywhere." Clean and seal drive and back patio. 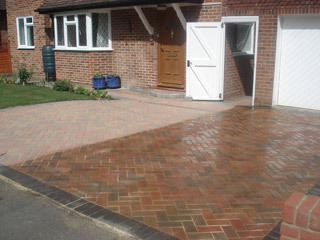 Clean patio, driveway and path, re-point patio with 'geo fix' seal. Pleased and impressed with work carried out. Transformed my property. This team take pride in their work, many thanks, well recommended. Drive, patio and terrace cleaned, sealed and sanded. "The work was started on the date quoted with the minimum of disruption. Nothing was too much trouble and they were very keen to give the best possible service. Left site very clean." Cleaned patio and moss off brick work. "Outstanding work, very impressed with the outcome. Would definitely recommend this company to anyone." Block paving and patio cleaning. "Very professional service. Had drive cleaned before, no where near as good as services provided by Mr Boswell." "Very good standard of work, would recommend and happy to use again." "Platinum Sealing and Cleaning Services transformed our very dirty driveway, patio and back garden walling into an eye-catching delight. We highly recommend this company to anyone who wants a first class service. Luke Boswell went that extra mile for us." "Provided a very friendly, punctual and efficient service." "Very happy with the work carried out and would recommend them to anyone that asked." Cleaned concrete drive and patio. "Highly recommended. Quick and efficient and good value for money." Cleaned patio and re pointed. Platinum Sealing & Cleaning Services recommends that you choose to seal your paving after cleaning to ensure your driveway or patio area remains weed free and stable; prolonging lifespan and preventing paving failure. This is achieved by using our high quality two coat acrylic sealer. The acrylic when dry, hardens to protect the jointing sand from being washed away. This in turn protects the sub-base from being eroded and your driveway subsiding, thereby avoiding costly repairs. It also inhibits the growth of moss and weeds, and should you get an oil spill, it can be simply hosed or power washed away without causing damage to your driveway.